The main difference between BAPI and BADI is that BAPI allows connecting SAP systems with SAP or non-SAP systems while BADI allows adding enhancements to improve the functionalities without affecting the initial source codes. SAP is an Enterprise Resource Planning Software that supports the daily business functions of an organization. 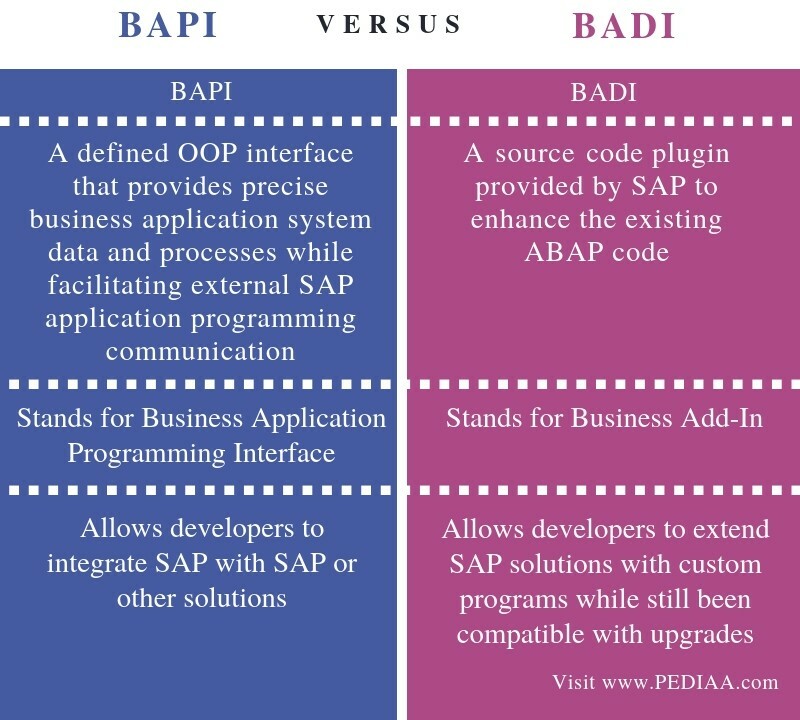 BAPI and BADI are related to SAP. BAPI allows establishing a connection between SAP and SAP or Non SAP systems. On the other hand, BADI allows the developers to improve the standard code of SAP according to the requirements. BAPI stands for Business Application Programming Interface. It works as an interface to transfer data from SAP systems to non-SAP system or between SAP systems. 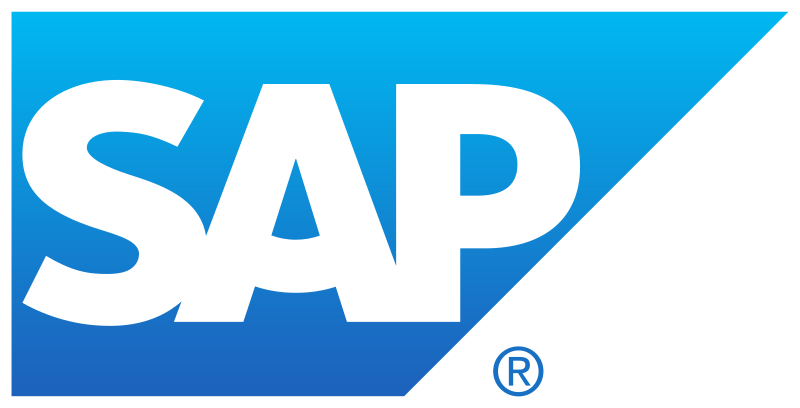 In other words, it connects customer code and third-party applications with the SAP products. BAPI confirms that all business logic, validation, and authorization checks are executed correctly when accessing or modifying business objects. It performs this task by wrapping BAPI with the internal layers of SAP’s business object. BADI, which stands for Business Add-In, is a source code plug of SAP. It helps to improve the existing Advanced Business Application Programming (ABAP – Language for SAP applications). These improvements support business processes. There can be no standard code that tallies with customer requirements. However, in BADI, it is possible to develop solutions according to the requirements without affecting the initial source codes of the object. There are two main components in BADI as BADI definition and BADI implementation. BADI definition assigns the exit point for the source code of the object while BADI implementation allows including necessary code without changing the original source code of the object. There are several advantages of BADI. The enhancement techniques in BADI uses object-oriented methods. Therefore, the developers can implement them multiple times in the application. BADI also provides upward compatibility. Furthermore, there is no effect on functioning due to release upgrades. BAPI is a defined OOP interface that provides precise business application system data and processes while facilitating external SAP application programming communication. BAPI is a source code plugin provided by SAP to enhance the existing ABAP code. Thus, this is the main difference between BAPI and BADI. BAPI stands for Business Application Programming Interface while BADI stands for Business Add-In. BAPI allows developers to integrate SAP with SAP or other solutions whereas BADI allows developers to extend SAP solutions with custom programs while still been compatible with upgrades. Hence, this is another difference between BAPI and BADI. The difference between BAPI and BADI is that BAPI allows connecting SAP systems with SAP or non-SAP systems while BADI allows adding enhancements to improve the functionalities without affecting the initial source codes. 1. “What Is Business Add-In (BADI)? – Definition from Techopedia.” Techopedia.com, Available here. 2. “What Is SAP BAPI (Business Application Programming Interface)? – Definition from WhatIs.com.” SearchSAP, Available here. 3. “What Is BADI? SAP ABAP Tutorial.” Meet Guru99 – Free Training Tutorials & Video for IT Courses, Available here. 4. “What Is a Business Application Programming Interface (BAPI)? – Definition from Techopedia.” Techopedia.com, Available here.